Freetail Brewing Company is a local San Antonio Craft Brewery that has been spitting out the goods since 2008. Since they started as a brewpub, which brewed a lot of different small batch beers that has now grown into a larger full production brewery in a second location, and still operates the small batch brewpub, I have had the pleasure of having well over 110 different beers by them. Holy Hell, that’s a lot! Back in 2012, Freetail Brewing Company held their Super Mega Awesome Bottle Day, which saw the release of 5 new rare bottles, RealTail ’12, Porto Gallito, Fortuna Roja, Raspberry Ananke, and Yo Soy Ün Berliñer. I pack my bottles in large crates, so finding this bottle right now is near impossible without ravaging through a few crates, so I could see the year on the bottle. According to my sources from within Freetail, there was a 2012 and a 2013 release in this packaging. This beer was in a 22 oz. bomber, which featured a mostly black and white label consisting of a wicked looking frontal view of a flying bat, and the name of the beer in a large, grungy font. The label is complete with a grungy border, black, white and grey scratches and lines to give this label a run down, old feel to it. 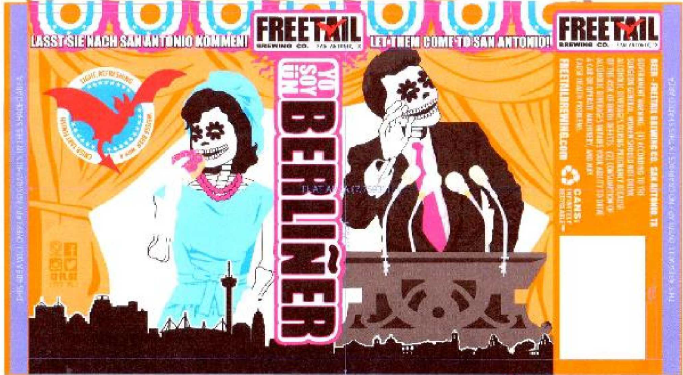 Recently, Freetail released Yo Soy Ün Berliñer again, but this time in cans. With the new release and re-packaging of this beer, new artwork was given for this to match the brewery’s new style of Dia De Los Muertos art, and the dropping of the wording “Barrel Aged Series.” I was given an interesting story about this. When this beer was first being made, it was taking long to sour, so the beer was aged in barrels to quicken the souring process. The newer version of this beer are kettle sour batches. I have had this beer on draft and in cans since the change, but this review is from the last time I had the Barrel Aged Series, 22 oz. bomber version. Poured into a Rahr & Sons Iron Thistle chalice glass, this beer’s appearance was a clear golden color with no head at all on the initial pour. This left no lacing at all on the glass. The aroma was sour, and had notes of lime, salt, lemon, wheat, cereal grains, and a hint of wood. For me the lemon and lime characters stood out in the nose, and lingered after each whiff. You have to love the teeth hurting tartness of a good sour beer, even in a Berliner Wiess. Once the sour clears away, a hint of lemon and lime show through, mixed with some saltiness. There are flavors of wheat, cereal grains, woodiness, and a small trace of green grass. Nice aftertaste of lemon and lime lingers a bit after each drink. The body is light, with a crisp and bubbly mouthfeel, and a dry finish. Overall, I will say that this Berliner Weiss was in fact very refreshing. As I said earlier, I have had this beer on several occasions, and have served this beer at the Brewpub I work at. This particular version was aged a couple of years, but all the aroma and flavor was still in tact. This style of beer is definitely not for everybody. In fact, I did not like my very first Berliner Weiss. It took me several different times, until I could finally say that I enjoy this style of beer. Yo Soy… being brewed locally, and easily available, this one grew on me, and then I tried different ones from other breweries. Thanks Freetail for helping me enjoy Berliners. Cheers! 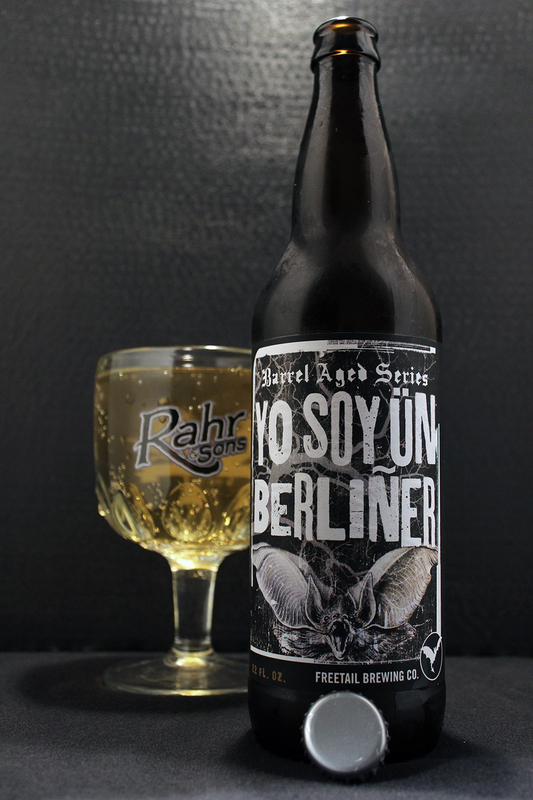 Metal Connection: Yo Soy Un Berliner translates to “I am a Berliner.” Finding a Metal song with a title to match this beer was impossible. Trust me, I tried! So I did the next best thing. I found a song with a very similar title to the beer’s name. I introduce you to “I am a Viking” by guitar shredder, Yngwie Malmsteen, in 1985 on his second solo career full length album, Marching Out. I mean, why not, right? Vikings love to drink alcohol. 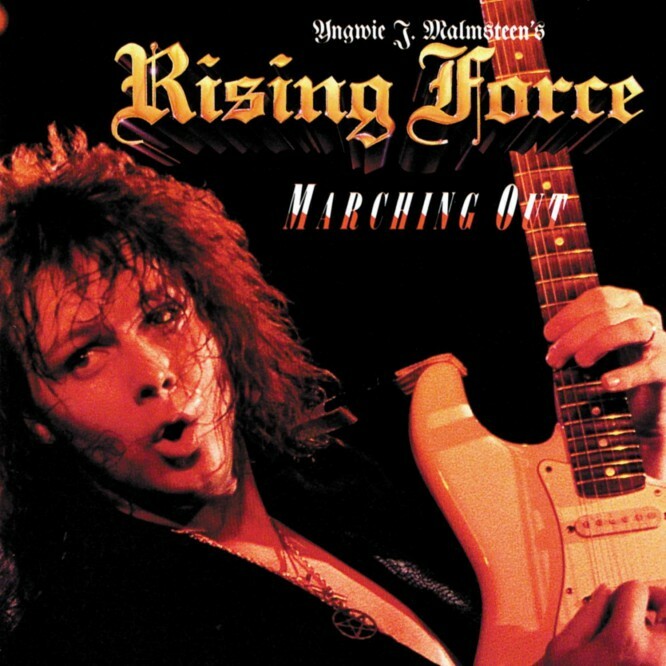 On this album the band is known as Yngwie J. Malmsteen’s Rising Force. Malmsteen’s solo career started in 1978 in Sweden. In the early 80’s, he was brought to the US and debuted on Steeler’s only full length album, Steeler, and also on the debut album, No Parole for Rock ‘n’ Roll by Alcatrazz. Cool side note, Alcatrazz would feature another guitar legend, Steve Vai right after Malmsteen left the band. Once Malmsteen left these two bands, his solo career was relaunched, and he is still active and to this point, has released 19 full length albums. Throughout this career, he has released albums under the names Yngwie Malmsteen, Yngwie J. Malmsteen and Yngwie J. Malmsteen’s Rising Force. Another cool side note, is that the vocalist on Malmsteen’s first two full length albums, Jeff Scott Soto does vocals for the Trans-Siberian Orchestra, a Progressive Rock/Metal/Orchestral group famous for rocking out Chritsmas tunes, and touring each year around December.